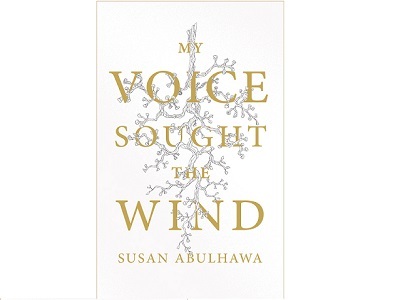 Susie Abulhawa, Palestinian poet, exile, mother, lover, friend, stands naked in My Voice Sought The Wind; her collection of trenchant and beautiful poems replete with honesties and literary seductions. Reading her poems is akin to being in conversation with a lyrically intelligent and passionate woman; a conversation that is at once intimate and universal shifting vividly in place and time, in emotion and insight, in self and the people of her poetic landscape. There’s something so right, so apt that her first poem for this book is The Gift of Olive Oil for like the essence of the olive, her poetry is ‘A token/ Something from the soil of things shared ‘ and the ‘heritage’,‘longing’ and ’a wound’ are its recurring songlines. And each poem, when you linger and ‘Press it between your tongue and palate’ will yield unexpected revelations into the darkness and radiance of human experience. Might there be mercy for us? thousands will not leave school to scrounge for food. Wala and Picture of a Family Man echo across oceans the stark contrast between life for Palestinian families and the petty-by-comparison modern western malaise of urban angst. Wala is a searingly poignant poem and Abulhawa asserts the power of the personal pronoun to connect or not; with the use of ‘you’ we are not only drawn into, but walk in the vulnerability of the Palestinian father while the ‘he’ distances us from the Family Man. Has Walid’s voice begun to crack yet? Have Wijdad’s hips begun to flare? Wala, mish hon el yom! There are 36 poems in this small volume that burst from the bindings to bind your heart and mind in a lyrical kinship with a poet who soars from ‘the precipice of history‘ bravely and with grace. Susan Abulhawa is also the author of Mornings in Jenin and the founder of Playgrounds for Palestine. My Voice Sought the Wind is published by Just World Books.